Granola makes the perfect breakfast or snack. Try this easily customizable version today! 1. Preheat oven to 350°F. Lightly coat a 9x13-inch pan with cooking spray. 1. Combine oats, puffed wheat cereal, walnuts, cinnamon and coconut in a large bowl. Toss to combine. 1. In a small sauce pan, add the honey, canola oil and brown sugar. Heat over medium heat until just melted. 1. Pour the warm liquid ingredients over oat mixture. Stir all the ingredients together until evenly coated. Mixture will look dry. 1. Spread oat mixture into prepared baking pan. Bake 15 minutes. Remove from oven and stir. Bake additional 15 minutes until toasted and golden brown. Remove from oven and stir in chopped dried fruit. Cool completely in pan. 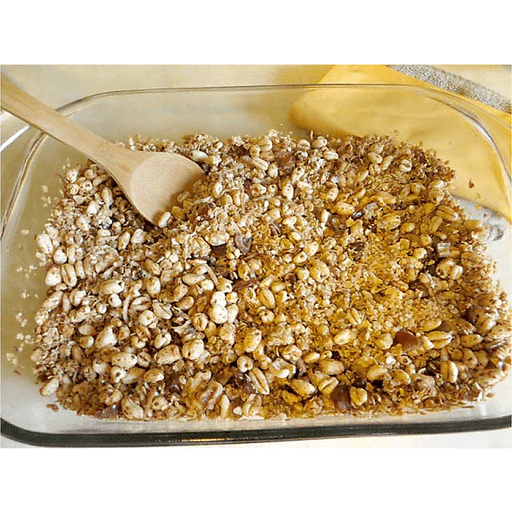 Break granola into chunks and store in an airtight container or plastic bag. Calories 320, Total Fat 15g (Saturated 2.5g, Trans 0g), Cholesterol 0mg, Sodium 20mg, Total Carbohydrate 45g (Dietary Fiber 4g, Sugars 22g, Includes 14g Added Sugars), Protein 5g, Vitamin D 0%, Calcium 2%, Iron 10%, Potassium 2% *Nutritional values are an approximation. Actual nutritional values may vary due to preparation techniques, variations related to suppliers, regional and seasonal differences, or rounding.